Scott Parsons is an international award-winning artist. He has received numerous public art commissions across the United States and Canada. His portfolio includes percent-for-art and private commissions for churches, museums, airports, hospitals, research facilities, university buildings and transportation centers. 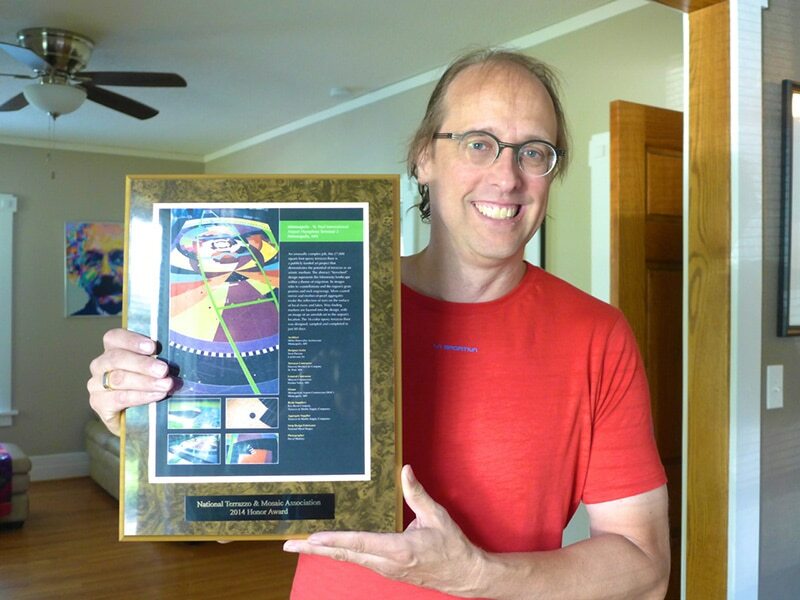 Scott was recognized by Art in America for creating one of the most significant works of public art in the United States in 2002. He has received national and international awards for his art, including multiple awards from the Interfaith Forum on Religion, Art and Architecture (IFRAA), a Knowledge Community of the American Institute of Architects, and multiple National Terrazzo and Mosaic Association Honor Awards. Parsons’ work is reviewed in more than 100 publications, including Architectural Record, Sculpture, Art in America, Stained Glass Quarterly, Public Art Review, Leonardo, the European Journal of American Culture, High Performance, and Museum Anthropology. The artist received his M.F.A. from the University of Colorado at Boulder, and his bachelor’s degree in art from Augustana University where he teaches printmaking, architectural art glass, and drawing. Scott lives with his family in Sioux Falls, South Dakota. I am inspired by the idea of place, of defining a space with a sensitivity that can transform, celebrate, and engage the redemptive qualities of metaphor for the profoundly personal and communal in people’s lives. The insight of Scott Parsons is right on. That the breath of God’s creation of man is a particular signal contained in blown glass is not only a precious gift of intelligibility but is also worthy of further reflection. His windows in the clerestory of the Church of Our Lady of Loreto recall also a related mystery: the ruah of God, “the wind, the breath, the spirit” of God sweeping over the waters in Genesis 1. The chaos below never escapes the formative Logos of God. “Through the Word all things were made that have been made.” Parsons has unfolded visibly the drama of the freedom of a loving Creator. Thanks for sharing these associations. They have caught again the dramatic nature of truth. By their polarities the beauty of the blown stained glass windows in the Church is a plot thickener. Parsons’s windows become revelations of two freedoms – divine and created. Our grasp of these sacred narratives is first set in motion by the epiphany of their splendid drama – a free mix of ordered movement, color, light, earth, forms. All these realities are simultaneously sensible and intelligible. They become intelligible through movement from the exterior to the interior, from outer accidents to inner weightiness. Their beauty is discovered in the artistic elements where particularities convince the mind of their truth and their goodness gives rest to the will. As I indicated this dynamic polarity of truth and goodness is the stuff of beauty. Once Parsons’s beauty elicits our wonder before the choirs of Dionysius’ angels, then our freedom is further engaged in the drama of God’s diffusive goodness. For God’s absence is made present in the goodness of the created hierarchies represented by the ascending prayer of the angelic choirs. Finally, we grasp the truth of the reality before us through our participation in the acts of adoration in communion with the angels. The culmination of the cognitive act happens when minds and hearts are introduced into and moved directly by the power of the Word into the liturgical events unfolding visibly before us. United States Supreme Court Justice Sonia Sotomayor, Washington, D.C. Thank you for your role in inspiring the imagination of these young children. Ich komme öfter in die Werkstatt und schaue mich neugierig um, was es neues gibt. Bei einem dieser Besuche waren die Fenster von Scott Parsons im Ausstellungsturm aufgebaut und sie haben mich tief berührt. Ich war überwältigt von der Schönheit und der Dichte der Arbeit, dem Dialog der einzelnen Abschnitte und Fenster miteinander und dem Gesamtkonzept. Ich verspürte eine große Freude, da es ein ganz anderer Ansatz als meine eigene Arbeit ist; wobei so ein starker Eindruck von der Arbeit überspringt, dass ich überzeugt bin, dass Scott Parsons die Menschen erreicht und berührt. Das Erreichen der Menschen ist die Hauptaufgabe von uns Künstlern. Scott Parsons Fenster haben mich erreicht und ich war lange nicht mehr so berührt wie von seinen Fenstern. Your art continues to take my breath away. You create such beautiful, dynamic, lyrical work. Thank you for your part in making beauty present. I really do admire your work – it is the most exciting art on stained glass I have ever seen. We have not met, though I am familiar with your work—— actually I am more than familiar, I am a great admirer. I first saw it published in CODAworx a few years ago, I believe, and then continued to discover it published a few other times since. AND, then, I saw it being produced at Derix when I was there in March and was completely blown away. It literally took my breath away. I have been a glass artist for more than 45 years and thought I had seen it all and knew who was doing what, but how wrong I was. I realized that you have found a new vision for glass, one that doesn’t come from a stained glass tradition, yet it is stained glass, but so much more. When I was in Germany I spent some time with a very old friend, Johannes Schreiter, and the conversation moved to your work, which he is as impressed with as I was. As I look over your web site again, I am continually amazed with the freshness of your designs.